I am without a doubt on a "roasted" veggies kick. In an attempt to increase the balance of alkaline to acidic foods in our diet I am trying even harder to increase our consumption of veggies. But we get bored of raw and steamed. After roasting Cauliflower for the first time last week and discovering that it was AMAZING I decided to keep going with broccoli, cabbage and asparagus. The broccoli was hideous, the asparagus was okay but the cabbage earned another AMAZING! If you read my Sunday Week in Review you will notice that we eat a pot of Ham and Cabbage soup almost every week. So obviously we love cabbage. Must be the Ukrainian in us. It gets a little bit sweet when roasted and gets tender but not soggy. Unlike when you fry it. Love it. And don't forget its cheap (always a plus in my book) and full of fiber(which I need to offset this iron pill business wreaking havoc on my stomach). Some consider it a SUPER food. Why not. Oh yeah - and its alkaline. And it goes great with meatballs. Oh, and I bet Kobasa too! I feel like doing a polka. Pepper, parsley and celery seed (I didn't list amounts as I used less than 1/8 tsp for each). Just give it a light dusting. Preheat the oven to 400 degrees. Liberally grease a 9 x 13 glass dish with olive oil (about 1 Tbsp). Layer half the onion and cabbage in the casserole. Top with sun-dried tomatoes. Sprinkle with half of the salt and garlic and lightly dust with pepper, parsley and celery seed. 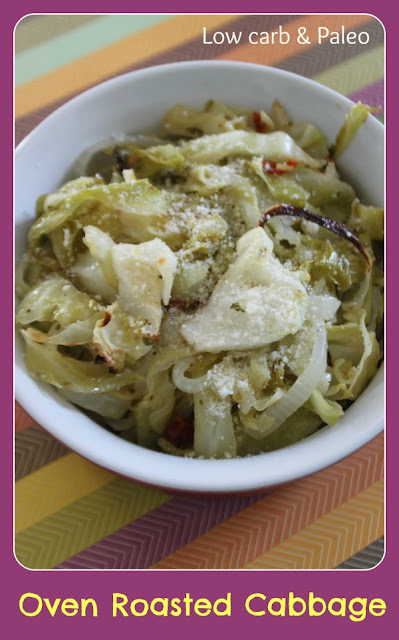 Layer with remaining onions and cabbage. Drizzle melted butter evenly over the cabbage. Repeat seasonings. Bake for 40 minutes. Gently stir approximately every 10 to 15 minutes. Enjoy!